New Stridex Deep Pore Treatment with Activated Charcoal in a 2-in-1 Pack contains a pre-treatment gel with activated charcoal in the cap, and cleansing pads with 2% salicylic acid in the jar. Oil-extracting purifying gel absorbs oil and pre-treats problem areas. Alcohol-free pads are easy on the skin, tough on acne. Top cap contains super-activated charcoal gel. Amount is just right for 3-4 times/week use as an every-other-day booster. Jar contains 70 daily use pads, maximum strength. Combines great effectiveness, convenience and value. 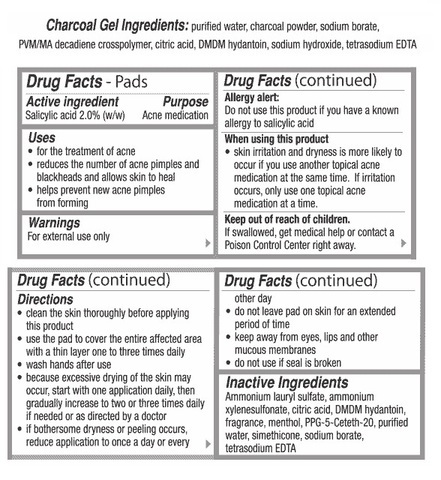 1-stop approach to clean and treat/prevent acne. 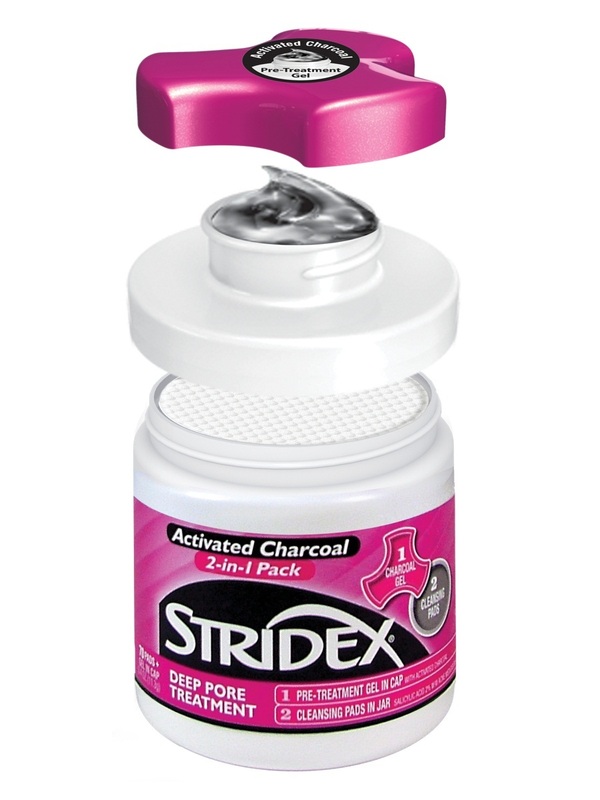 No brand is better associated with pads than Stridex. Pads clean, treat and prevent. 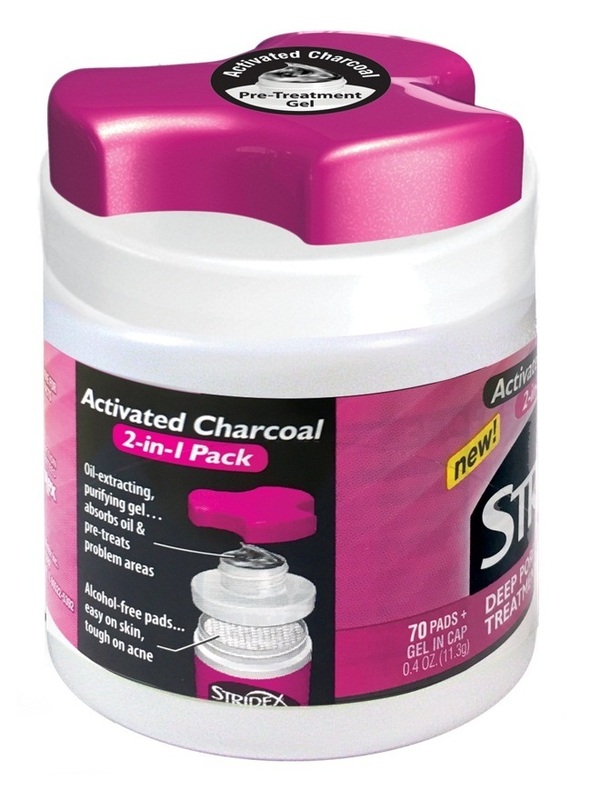 Charcoal gel acts like a booster helping the pad do all three things, better. 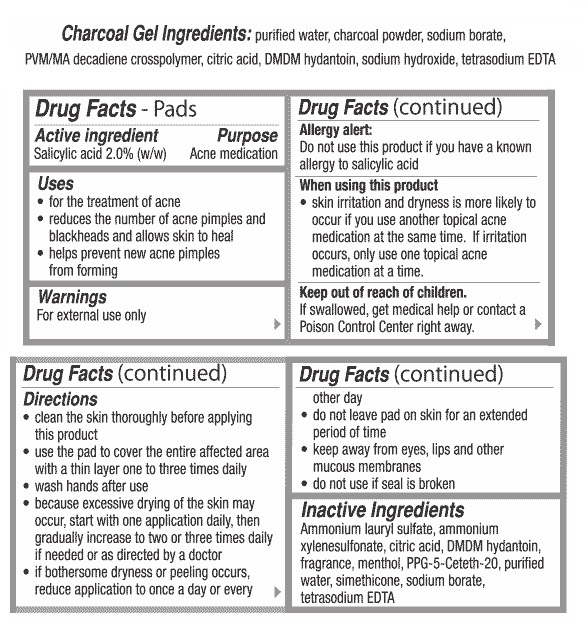 Active Ingredients: Salicylic acid 2.0% (w/w) (acne medication). Inactive Ingredients: Ammonium lauryl sulfate, ammonium xylenesulfonate, citric acid, DMDM hydantoin, fragrance, menthol, PPG-5-ceteth-20, purified water, simethicone, sodium borate, tetrasodium EDTA. 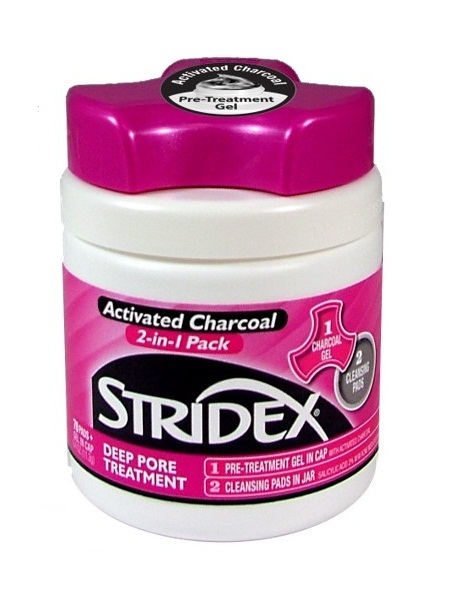 Step 1: spread a thin layer and leave on for at least 30 seconds for Activated Charcoal pre-treatment. Step 2: Use soft-textured cleansing pads to wipe off charcoal, dirt and oil, and leave maximum strength medication behind. 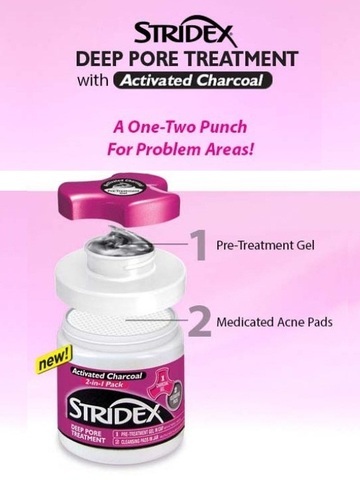 Stridex Deep Pore combines the power of activated charcoal with the proven cleaning and acne-fighting strength of Stridex Medicated Pads. The 2-in-1 pack offers a convenient and comprehensive regimen for clearer skin. The concentrated, super absorbent pre-treatment gel is packed with activated charcoal which acts like a booster to draw out dirt and oil. It’s so absorbent that each jar contains enough charcoal to cover over half of one football field end zone or almost 7 NBA courts! The Maximum Strength Pads contain 2% salicylic acid and wipe away the charcoal gel, impurities extracted from the pores, and anything your face wash missed…leaving medication behind to clear up existing pimples and prevent future breakouts. The gel formula spreads on smoothly and is easily removed with Stridex Pads. The pads are also completely alcohol-free to prevent drying and irritation of the skin. When using this product Using other topical acne medications at the same time or immediately following use of this product may increase dryness or irritation of the skin. If this occurs, only one medication should be used unless directed by a doctor. If swallowed, get medical help or contact a Poison Control Center right away. Keratolytic action helps unclog pores. Each paid is specially textured for great cleansing with a great feel. Whether you want scrubbing or smooth, soft application, this paid is up to the task. 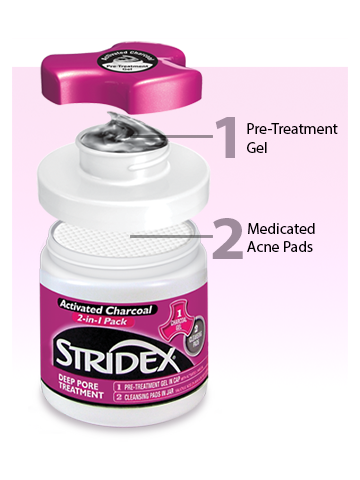 Stridex pads formulas are completely alcohol-free so you get proven acne-fighting effectiveness without the burn. 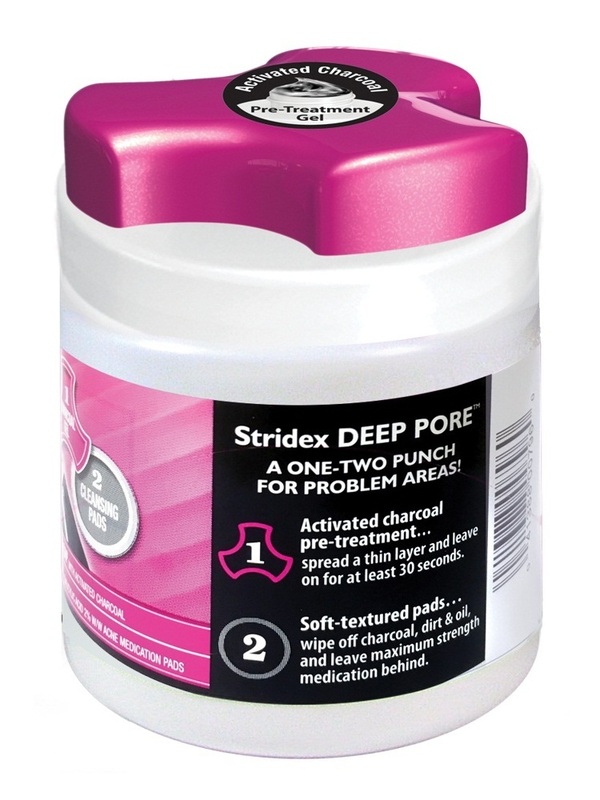 Stridex pads unclog pores and dissolve deep-down oil. They even remove what cleansers and soaps leave behind.